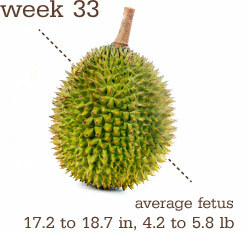 At week 33, baby weighs about 4.2 to 5.8 pounds and measures about 17.2 to 18.7 inches. She may even grow up to a full inch this week! She’s turning into a curious kid who can keep her eyes open while awake, and she’s starting to coordinate her breathing with her sucking and swallowing. Those baby bones are continuing to harden as well. Heavy. Clumsy. But mostly OK. Starting to feel some pressure now and again, and I get Braxton Hicks contractions pretty easily when I’m up doing stuff, but they go away when I sit and relax. 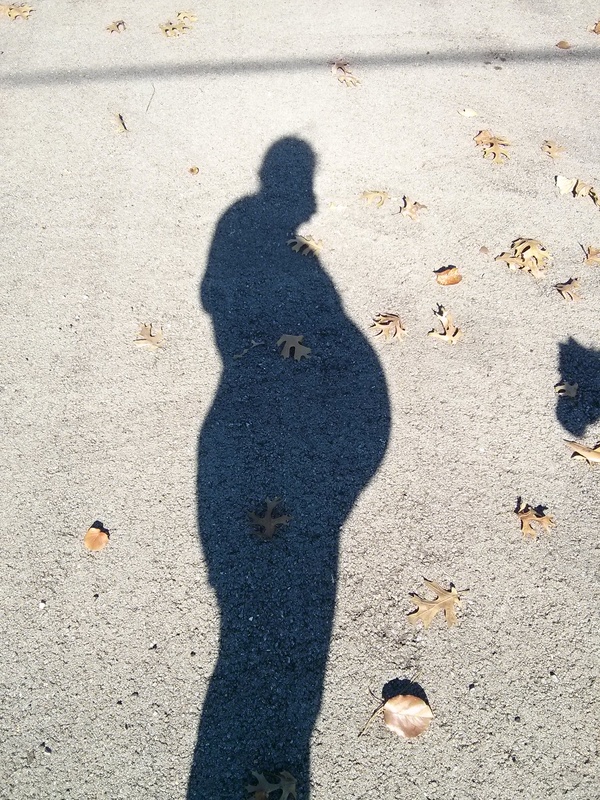 So…probably pretty on par for 33 weeks. I had my prenatal appt on Monday and I was actually down 2 lbs! Go figure. I feel like by the time my next appt rolls around there will be another increase, though. This belly is getting heavy. And awkward. I miss comfortable sleeping at night. I had one really good night about 2 nights ago where I slept from about midnight till 7am without having to get up or be aware of rolling over or anything. It was nice! But most nights I am up 3 times to pee and change positions who knows how many times. And I guess it hasn’t been long enough to be out of that new mom mindset, because even in the middle of the night, as soon as I wake up, I’m AWAKE. Like, not groggy or anything. Guess that’s good, since I’ll be needing that skill again here in the next month or so. Urijah starts school on Monday! I’m looking forward to that (and also dreading it a little, too.) Deep down I know he’s going to like it – I mean, what’s not for a two year old to love about music and playgrounds and toys and other kids and snacks and reading? But also dreading for the obvious reasons….I know he’ll have separation anxiety, and he has such a sweet little sad face…it just stabs you through. And, you know, he’s never been away from me for any regularly scheduled time before. We’re a team, so it’s going to be weird to be without him nearby. BUT! It will give me some much needed downtime at this stage in the pregnancy, and after baby brother comes along, we can have a bit of our own one on one bonding time. So, it’s good for everyone, but not necessarily without its bumps. OK. The carpet is in, U’s room is painted, new blinds are hung, ceiling fan is in and all we need to do today is move his crib and toys and whatnot! Once we get the stuff in the room, we can see where we want stuff and we’ll hang up a shelf and some pictures and wall art. I’ll probably look into getting another bookshelf for his room and separate out the baby books from the bigger kid books…even though he does still like to flip through the board books with my first words or colors. I think they can share, though. I’m planning on leaving the dresser in the baby’s room, since it doubles as the changing table. U’s clothes can stay in there, for the time being….at least until I realize that it’s a bad idea, for whatever reason, down the road. It’s going to be so strange to get out the baby sleeper that goes in our room…it’s been in the closet for a long time! I don’t think any of the new carpet pictures are off the camera yet, but maybe I’ll do a separate post about the remodel all on its own. Once his stuff is moved out of the baby room into the big kid room, then I can start re-setting up the baby stuff in the nursery. We’ll need to get another crib…at some point, but for a while baby number 2 will be in our room, so that can wait, if need be. U’s crib will covert into a toddler bed and then into a full bed so it will stay with him for the duration.